It was the first ride to use Audio-Animatronic figures and was revolutionary concept at a time when people thought jet backpacks were just around the corner. Here's to one of the greats. It's the only true version of The Enchanted Tiki Room left and it is still an amazing spectacle. They don't make them like they used to. 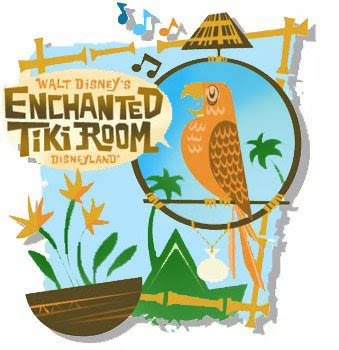 I hope Disneyland has a big celebration for the Tiki Room's 50the anniversary since it is the first audio-animatronic attraction. Audio Animatronics may be 50 years old, but I will take them over the Finding Nemo Submarine Voyage projections any day of the week. Audio Animatronics are still great and cutting edge. There was a line all the way down Main Street and wrapped around the central hub of Disneyland of people waiting to get a souvenir Tiki Bird signed by the original artists. I personally wouldn't stand for several hours in the 90+ degree heat for a signed anything. such a big line for that...I guess I underestimated the size of the Disney[land] fan community, there are a lot of us!